No one had come out of the transport since it landed fifteen minutes ago. It had been reported stolen from a Cat Girl breeding facility three days ago but had arrived with all the instruments on autopilot. “Sir it looks like all the escape pods are still on board so whoever set the autopilot must still be on board. Should we send in a team to investigate?” the space traffic controller asked. “Very well Sergeant. We can’t afford to hold up the landing field any longer.” The Captain said. “Send in a security team.” The Sergeant said into the intercom. They watched above from the tower as the ten Feloid soldiers ran across the airfield and up to the ship. They opened the main hatch and filed inside the craft. After a few minutes one of the soldiers came out carrying an unconscious cat girl. He quickly laid her on the ground and began checking her for signs of life. “What’s going on down there Lieutenant? The Captain asked through the intercom. “No one was onboard but this cat girl, a pink head. It’s strange. It’s like whoever was piloting the ship just vanished.” The Lieutenant replied. “She’s been drugged. We found the injector lying on the floor next to her.” The Lieutenant said. “Bring her inside to the sickbay and post two guards on the ship just in case someone is hiding on board.” The Captain said. The Lieutenant picked the girl up and carried her inside to the sick bay. After a few minutes the Captain joined him. The Captain leaned over the pink head cat girl and looked her over head too toe. “Very pretty, if we don’t find an owner I might just claim her as salvage.” He said grinning at the Lieutenant. “What else did it say in the report about the ship and the breeding facility?” the Captain asked. “It said that just before the ship was taken the staff had found the chief Doctor and a strangely dressed Human woman dead in one of the examination rooms. The killer must have stolen the ship and the girl then somehow made his escape.” The Lieutenant replied. “Seems odd though. Why leave the ship at all? Why not just land it somewhere where there is less security? And the girl, why bring her and then abandon her with the ship?” The Captain said examining the pink head girl closely. He rolled her over and unfastened her dress down the back. He saw at once that she had quite a few scars on her back from repeated heavy beatings in the past. “Look here Lieutenant, this girl has been a problem in the past. These scars show an intolerable continuation too lack of submission on her part.” The Captain maintained with certainty. The Lieutenant looked at the angelic face of the still unconscious girl. “Perhaps her owner was abusive. These pink heads are usually known for their compliant nature aren’t they?” the Lieutenant questioned. “Either way we won’t have an answer until she wakes up. There’s no sense in trying to guess what happened until she wakes up. Call for the surgeon. See if he can give her something to bring her around. I’m going back to the flight control tower. Call me when she’s awake.” The Captain said as he left the room. The Lieutenant saluted and watched as the Captain walked down the hall and stepped into the elevator. He turned back towards the girl only to see she was sitting up on the table sideways with her legs hanging over the side. She was rubbing her head as if confused. Evidently the drug she had been given to knock her out was still affecting her somewhat. Her dress hung down from her shoulders nearly exposing her breasts from the Captains examination. He couldn’t help noticing how beautiful she was sitting there in such a vulnerable state. “Well hello, are you feeling alright?” he asked taking a few steps closer to her. The girl looked up suddenly as if she didn’t know he had been in the room. She didn’t answer at first; she simply looked around the room and smiled. “Your ship landed here by automatic pilot. This is Outpost Eight Three Three on the border of Ty Clan controlled space. Who was with you on the ship? How did they get off of it with out using an escape pod?” the Lieutenant asked stepping even closer. “I don’t remember. The last thing I remember was being at the breeding facility asleep in my room.” The girl replied. She appeared to become a little nervous now as she started to regain her senses. “Am I in trouble?” she asked sheepishly. “No not at all we’re just trying to find out what happened.” The Lieutenant replied. She looked up at him with grateful eyes and smiled a little. “Thank you for your kindness master. I’m a good girl and don’t want to get in trouble. My old master beat me just for the slightest thing. He enjoyed making me cry.” She said pulling her dress down further and turning slightly to show him her scars. “Well there won’t be any need for that now will there?” he said admiring her soft young body. “Thank you.” She said pulling her dress up over one shoulder. “What will happen to me now?” she asked. “Well after we figure out what happened back at the breeding facility and we’re sure you didn’t have anything to do with it we’ll see if they want to pay for your transportation back there. If not then I guess you’ll become salvage like the ship and you will be sold to the highest bidder by the Ty Clan.” He said calmly. “Are the Freeborns here all as nice as you? I think they won’t pay to ship me back so I’ll most likely be sold.” She said rubbing her hands together anxiously. The girl looked down at the floor. “I think I would like you to buy me.” She said quietly. “Me? How come.” The Lieutenant asked surprised at her boldness. “I think you like me already and you seem very nice.” She said smiling. “Maybe I will. What’s your name anyway?” he asked. “I’ve had many names but the one I like best of all is Enna.” She said grinning happily. “Steady now we’ll only get one chance at this.” Zohe said calmly. The crew was all at their stations and ready. 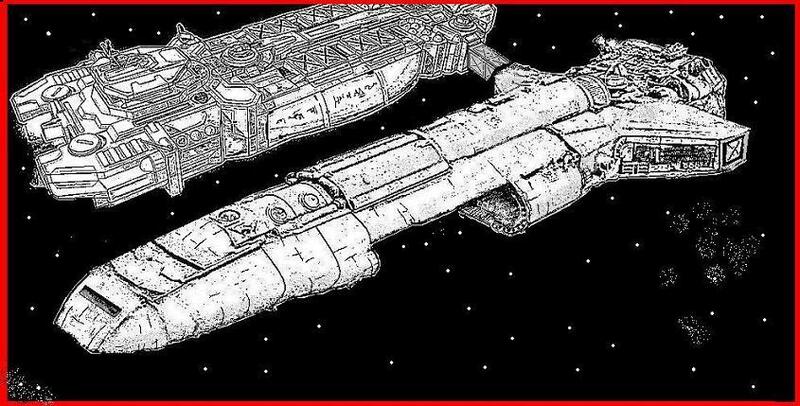 An Imperial customs ship looking for contraband items being smuggled in and out of Feloid space had stopped them. Since the conflicts between the Empire and the Feloids security towards any new Feloid ship wishing to do business in Imperial space had been beefed up. The customs ship pulled along side and extended it’s docking tube. The two ships were soon connected and a boarding party was sent over from the Imperial ship. Zohe had made her way to the airlock and was waiting for them. As soon as she saw them approaching the hatch she opened it and gestured for them to come inside. “I’m the Captain of this ship. How may I help you gentleman?” Zohe asked. “We’re looking for anything illegal onboard. This ship doesn’t show up as having done business in Imperial space so it must be registered and searched. Do you have anything onboard you want to declare before we search?” The officer asked. “I don’t know, it depends on what you call illegal.” Zohe replied being slightly sarcastic. As expected the Imperial officer didn’t find her sense of humor that amusing. He needed to be professional in front of his men. “I’ll let you know when we find it.” he replied sternly. “Well come on in and take a look around we don’t have anything to hide.” Zohe said straightening the officer’s collar seductively. He brushed her hand away as if she had just touched him with a dead animal. She was certain now that he was a fine and loyal Imperial officer. He had shown that an alien touching him in such a way repulsed him. “My apologies sir.” Zohe said once again sarcastically. “What happened to your arm?” the officer asked seeing it was heavily bandaged. “I slipped off one of the ladders going down into the cargo hold.” She replied. “Come with us while we search the ship, we may have some questions for you.” He said. Zohe followed the officer. The rest of the boarding party followed her. Every room was checked completely until they reached the crew’s quarters. “I can’t allow you in this room. One of my crew is sick and I’m afraid it may be contagious.” Zohe said as she stood in front of the door. “Stand aside. I’ll determine if someone is sick or not.” He said pushing past Zohe and opening the door. He froze in his tracks at what he saw. In the darkened room was a Feloid woman standing in a shear ghostly white gown. She had her eyes rolled back and her head cocked to one side. She was drooling as she swayed back and forth slowly. Her hair was white as was her skin. He had never seen anything like it before. “What’s that? What has she got?” the officer said shocked. “We don’t know exactly. None of us have ever seen anything like it before.” She replied trying to sound as useless as she could. “You idiots! We could all be infected now!” the officer screamed. “She didn’t look that bad a few hours ago. I guess whatever it is spreads pretty quick huh?” Zohe said. “A few hours ago!” the officer said alarmed. “Don’t get mad at me, I told you not to open the door.” Zohe shot back. Her plan was working better than she had hoped. This officer knew it was his fault and Sister’s creepy performance as a sickly space plague victim had come across quiet convincingly. “Take her to the sickbay on our ship. We’ll have to see if we’ve been infected.” He ordered. Two of the Imperial crewmen entered the room and found Sister sprawled on the floor. They quickly wrapped her in a blanket and carried her down the hall towards the Imperial ship. “Hey where are you taking her?” Zohe asked angrily. “She has to be put in quarantine until we can determine what she has and if it’s contagious.” The officer replied. “Well I’m coming too. I’m responsible for all of my crew.” Zohe said. “You fool! We all have to be quarantined now. We all might be infected.” He yelled. “I told you not to open the door.” Zohe said reminding him. After some confusion and shouting both crews finally wound up on board the Imperial ship. Zohe’s crew’s luck was still holding out. The Imperial customs ship was a small one with a crew of only about twelve. This would be important for the next step of the plan. The officer had the ships medical droid do a quick examination of Sister to determine what was making her so sick. Zohe’s crew had been told to wait in the hall just outside the sickbay so they too could be tested. Zohe was in the sickbay along with the ship’s officer, Sister and the medical droid. The rest of the crew had been ordered back to their stations. Since the airlock on both ships had been open both crews had a good chance of being infected so there was no sense in isolating anybody at this point. “Well, what’s wrong with her?” the officer asked the medical droid. “I cannot determine the cause of her condition. All of my tests say she is a perfectly healthy Feloid woman.” The droid reported. “What are you talking about? Look at her. She has no complexion at all. She’s as white as a corpse.” He insisted. “Be that as it may sir my tests still show she is perfectly healthy.” The droid insisted. Sister coughed heavily in the direction of the officer causing him to stumble backwards and turn away. Sister quickly shot a wink at Zohe then sighed heavily and fell back onto the table. “Well what are you going to do now?” Zohe asked the Imperial officer. “This doesn’t make any sense. The medical droid should be able to determine what’s wrong with her.” the officer said frustrated. “Unless…” Zohe began to say. Sister sat up and pulled him close. “Unless there’s nothing wrong with her in the first place.” She whispered in his ear. Zohe saw in his face that he now realized that he had been tricked. But before he could call out Zohe hit him with her arm in the heavy cast sending him sprawling onto the floor unconscious. Zohe and Sister looked at him a moment and then back at each other and smiled. Zohe then quickly shut down the medical droid before it could sound an alarm. Matt walked into the mess hall. Pep, Pidge, and Bronski were all sitting down and waiting for him. “Well what’s the good news?” Bronski asked. Matt had been looking at the star charts trying to find a safe place to go. “It looks like our only option is to go the Fringe worlds. It’s about as far away as we can get and there are plenty of uncharted settlements out there where we can hide. It should be nice and quiet on one of those worlds. A lot of people go there to hide so nobody asks their neighbors any questions.” Matt said sitting down. “It sounds nice.” Pep smiled. “There’s still one problem Matt, we always got paid in Republic credits. Even though the Empire still uses them they don’t like taking them out in the Fringe, to easy to trace. We’ll have to find someone to exchange them for us before we can go.” Buck said. “I know, I haven’t figured that part out yet. Whoever we find will want to take a big chunk for their trouble so that might make it harder to buy the stuff we’ll need to get settled.” Matt conceded. “Couldn’t I do it? I’m not wanted by anybody. When the Empire captured me the others none of us was ever processed. We were all being taken to a labor camp to have that done when we tried to take over the ship.” Pidge said. “Are you positive?” Buck asked. “Yeah.” Pidge reached into her coveralls and pulled out he identity card. “Look I still have it.” she smiled. “It still might be risky for one of us to do it.” Matt said. “Yeah but you won’t have anybody taking a cut of the money. I’m sure not going to charge you anything.” Pidge replied. They all knew it was true. Exchanging the money they had earned as mercenaries would be dangerous and costly. “There is one other place we could do it.” Bronski mumbled half under his breath. “It’s not too far from here but you’ll have to trust me and not ask any questions.” Bronski said in no uncertain terms. “No questions huh? All right Bronski we’ve trusted you this long and you’ve always done right by us. Go ahead and set the coordinates and we’ll all just sit back and enjoy the ride.” Matt said. “Hey. This trip is going to be very hard on me but I’ll do it for you guys. This is the last person I want to ask a favor from in the entire Galaxy but I’m going to do it for you guys just this once.” Bronski snapped. He was visibly shaken and angry at this favor he was about to ask of this person. “Look if this is going to be that much of a hardship on you then maybe we should try to do something else.” Matt said trying to calm Bronski down a little. “No. This is the only way. This person won’t charge me for the transaction and I can trust them not to say anything to anybody about it.” Bronski said frustrated at the undertaking that lie before him. “Well at least the accommodations are nice.” Mykala said sarcastically. She had been harassing Destriss about having to take a ride on a slave ship back too the base and Haven. The accommodations she was referring to was the tiny room they had been assigned by the ship’s captain. He had been ill treated by the Ty Clan in the past and so he had decided to take it out on Destriss by giving Mykala and him the worst bunks on the ship. The room was usually used by slaves as their sleeping quarters on journeys so the mattresses and other items were less than adequate to say the least. Destriss looked at Mykala. He was becoming annoyed by her complaints. “I don’t remember you coming up with a ride.” He replied. “Don’t get angry I’m just joking. It’s not your fault this was the only ship available.” She said. “At least we’ll get there by tomorrow then we can get off this ship and find Haven.” Destriss said. “It will be nice to see her again. She’s stood by me no matter what without any thought of her own needs. I’ve really neglected her Destriss.” Mykala said solemnly. “It’s probably a good thing you have. If you had a stronger connection with her the Sith and the Emperor may have been able to pick up on it.” Destriss said as he wriggled around in the tiny bunk trying to get comfortable. “Whenever I die I return to her. I wonder what would happen to me if the worst happened to her. If she was dead what would happen then?” Mykala said half to herself. “Well once we pick her up and find a nice out of the way place to hide we can figure all of that out then.” Destriss said. “Where will we go? There’s no place they won’t look for me.” Mykala asked. “We’ll hide here, in Feloid space. There are plenty of out of the way places controlled by allied Clans and businesses. They’ll never think we stayed.” Destriss said finally finding a comfortable position. “They found me before they’ll do it again.” She countered. “No they wont. The Ty Clan will announce shortly that they will only offer the Jedi sanctuary and not aid. The Emperor won’t waste resources to find Jedi that have decided not to fight anymore, even you. He has much bigger problems than you, you can bet on it.” Destriss said smiling trying to reassure Mykala. “I hope you’re right Destriss because I will have to bet on it…with my life. Timtam and Kero spent the night at Brumbarus’s house. He was overjoyed to find out that his little Pink Head wanted to stay on Geirgor and make it her home. The following morning Vultahn drove them to the houses where Pep’s sisters were staying. They were all older houses built before the agreement between Brumbarus and Lionette Ty but they were well constructed and the girls had covered the walls with a stucco type of mud and painted them. Timtam and Kero would stay in one of these houses until they decided where they wanted to live. The Lady Trahain soon greeted them as soon as they pulled up to the houses. “Ah Timtam how wonderful to see you alive. We were all worried when we heard you never reached your destination.” The Lady Trahain said giving her a hug. “We’re glad to be back in one piece.” Timtam said. She suddenly remembered Kero’s leg and looked at him embarrassed and repentant. He just smiled at her and looked at the Lady Trahain. “Well almost in one piece.” he said with a grin on his face. “Oh you poor thing are you all right?” The Lady Trahain asked. “I’m fine it’s the rest of my leg that has the problem.” He joked. He never wanted to show in anyway that the loss of his leg affected him. He knew Timtam felt guilty enough for having to cut it off. “Have you heard from Pep? We haven’t had any word from her at all after the war with the Visiok Clan.” Lady Trahain asked. “Well I suppose in times of war things get reprioritized due to circumstance. After all the trouble Pep went to bringing the girls here I can’t imagine her abandoning them to their fate.” Lady Trahain said. “No you’re right. She will contact you if she’s still alive but until then you should continue helping them adjust to their new lives. After all, they seem to be doing quite nicely under your care.” Timtam smiled. “Well at least you two are here and safe now. After you get settled in a used to how things work around here I would be happy to have you help me with the girls if you’d like.” The Lady said. “We have plenty of money to tide us over for now but we’ll have to get jobs to earn our way eventually.” Timtam said happily. It was really happening, they were settling down to a regular lifestyle. “Oh, I’m sorry Kero, what I meant was if you think that’s all right too.” Timtam said. She was genuinely regretful for not including him their conversation about their future here. “No no, you’re doing just fine without me butting in.” Kero said teasing her. In fact he was happy to see her taking the lead in conversations. Lady Trahain noticed his laid back attitude towards Timtam and how she acted. He never seemed to correct her or take offense at anything she said or did, she liked this Human. “Mr. Hudd you seem to quiet a remarkable specimen of your race if you don’t mind me saying so.” The Lady said. “I’ve always been around different races because of traveling with my father. He taught me early on that no two people are the same and there is good and bad in everyone. It’s just a lot easier to accept the differences in others and enjoy who they are because of the differences.” He said grinning. Timtam beamed with pride. She had the life she had only dreamed of as a slave. A good man, a safe home, and people she could count on if there was trouble.